Help fill in color in hard-to-reach areas of a full sun bed by planting small bed flowers. Growing in a range of shapes, sizes and colors, small flowers pack a commanding presence in the landscape, despite their size. They also complement larger flowers within the bed to create a cohesive design. Small flowers that thrive in full sun are often hardy varieties that withstand a range of growing environments. Some small bed flowers also have the ability to naturalize or spread around the bed for a sea of texture and color. Pansy (Viola x wittrockiana) is a low-growing herbaceous flower that prefers cool temperatures. It grows up to 8 inches tall with a maximum spread of 1 foot wide. The 2- to 4-inch-wide, showy, fragrant flowers on pansies have flattened face-like blooms. Pansy flower colors grow in a range of colors including, purple, white, yellow, blue, red, apricot and bicolor. Some pansy flowers have contrasting blotching or whiskering that makes for a vibrant display in the bed. The ovate to elliptical-shaped foliage on pansies is dark green and grows 1 ½ inches long. Pansies grow best in full sun to part shade and well-drained, consistently moist soil that is humus-rich. Plant pansies in USDA zones 6 to 10. Crocus (Crocus vernus) is a spring bulb that looks striking grown in masses along beds and borders. They thrive in full sun and grow up to 6 inches tall and wide to produce small, cup-like blooms, sometimes with a stripe. 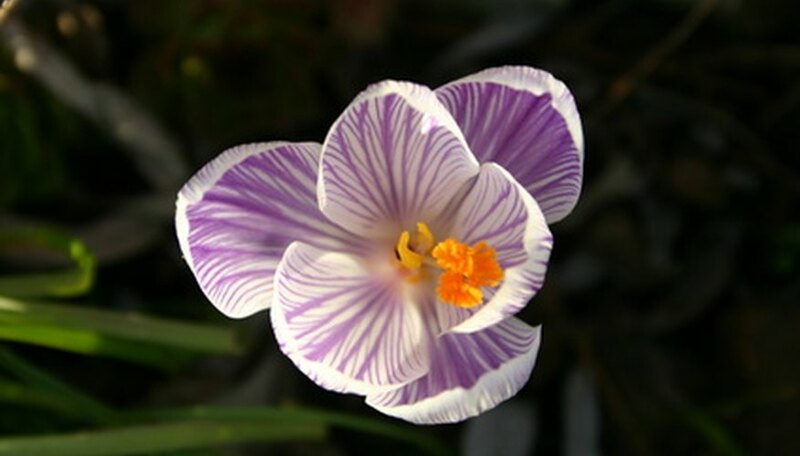 Each crocus flower blooms in early spring and on the 4- to 6-inch-long stems. The basal, grass-like foliage on crocus grow from the base of the bulb to create a clumping or clustered display to a bed. Versatile, crocus is easy to grow plant and also have the ability to naturalize or spread throughout the garden to create a sea of color. They grow best in well-drained soil and is suitable in USDA zones 3 to 8. Snowdrop (Galanthus spp.) is a perennial bulb that begins blooming in winter to last into spring. Low to the ground, it grows less than 6 inches tall and wide, an ideal flower to grow in a garden bed. According to the Missouri Botanical Garden, the common name refers to the supposed resemblance of the flowers to drops of snow. Each snowdrop bulb produces 1 ¼ inch-wide, narrow, basal leaves that reach 4 inches long at flowering. The single, waxy, white, bell-shaped flowers of snowdrop have a nodding appearance and green markings at the base of each flower. Snowdrops grow best in full sun to part shade and well-drained, nutrient-rich soil. Plant snowdrops in USDA zones 4 to 7.